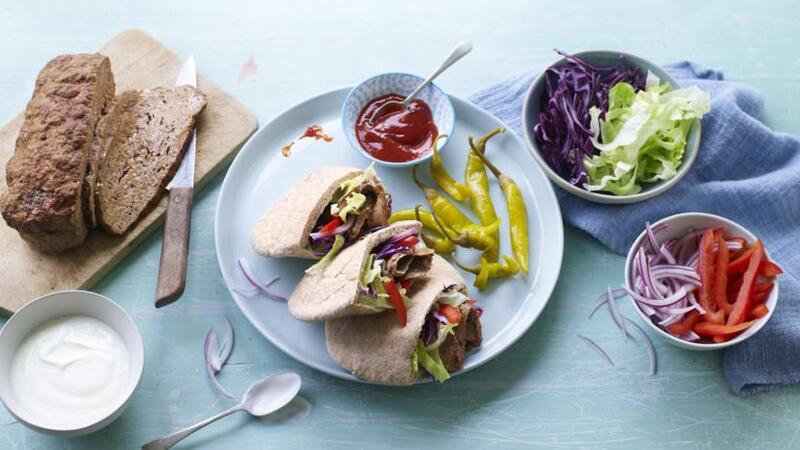 Make your own takeaway doner kebab with no anxiety or guilt. This homemade kebab is ready in 30 minutes. Equipment: you will need a 1kg/2lb 4oz loaf tin Each serving provides 386 kcal, 29g protein, 35g carbohydrates (of which 6g sugars), 13g fat (of which 6g saturates), 7g fibre and 2g salt. Preheat the oven to 200C/180C Fan/Gas 6. Brush the oil over a 1kg/2lb 4oz loaf tin. Tip the mince into a large bowl, add the garlic, spices and seasoning and mix with your hands until smooth. Press into the loaf tin and bake for 20 minutes. Set aside until cool enough to handle. Turn the meat out of the tin and slice the kebab lengthways into thin strips. Open up each pitta to create a pocket and pile in the salad ingredients and meat. Add chilli sauce and yoghurt, plus pickled chillies if using.